This statistic displays the monthly exchange rate (as of the end of each month) of the euro to the Czech crown (EURCZK), according to data from the European Central Bank, from January 2014 to March 2019. The concrete, or point in time, measure shows the exchange rate as of the last day of each month, which is different to the standardized measure; calculation of average based on observations throughout the period in question. Overall, the monthly exchange rate (as of the end of each month) of the euro to the Czech crown (EURCZK) has seen an overall decrease with some fluctuation. 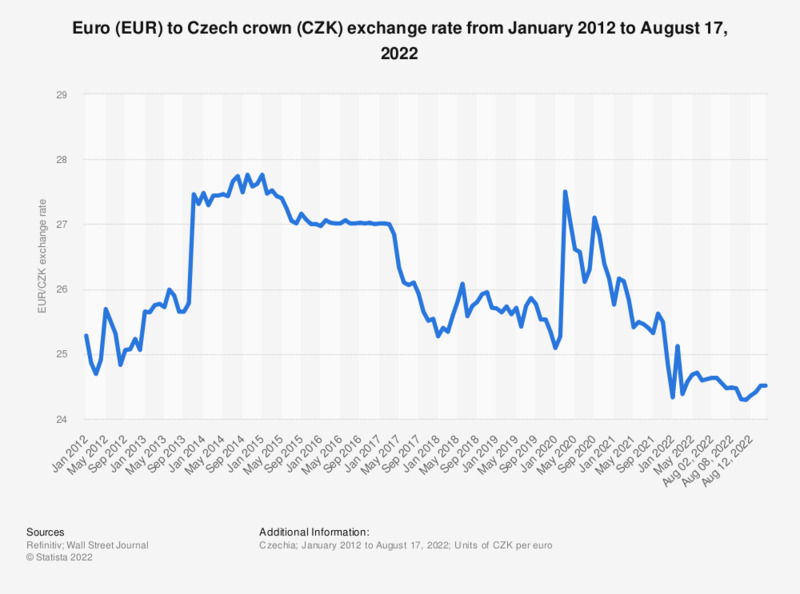 As of March 2019 the euro to Czech crown reached a value of approximately 25.8 which meant that one euro could buy 25.8 Czech crowns.